This modern semi-solid oak collection offers a large choice of both hinged and sliding robes with a stylish cross trim statement design across the centre in either plain or a carved natural wave look. 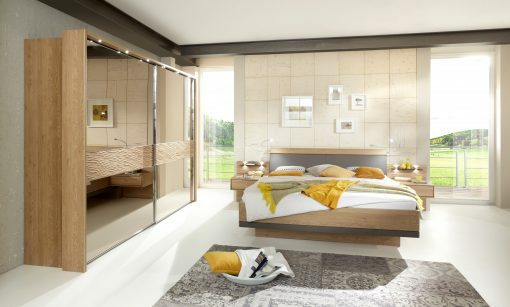 Wardrobe doors come with the choice of wood, mirrored or glass doors in havana and champagne colours. If maximum storage is key, don’t worry, extended corner and functional units are also available with this range. 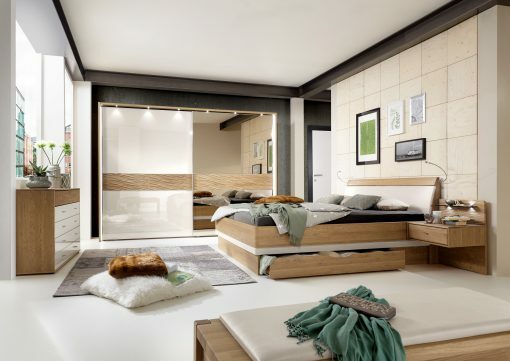 Wega also includes a ‘floating’ bedstead with headboard cushions available to co-ordinate to wardrobe colours and a selection of night and bedside cabinets, dressers, chest of drawers and combination cupboard and drawer storage units as well as a stylish dressing bench.